Do not use the browser Back button or close or reload any exam windows during the exam. Do not close Packet Tracer when you are done. It will close automatically. Click the Submit Assessment button in the browser window to submit your work. 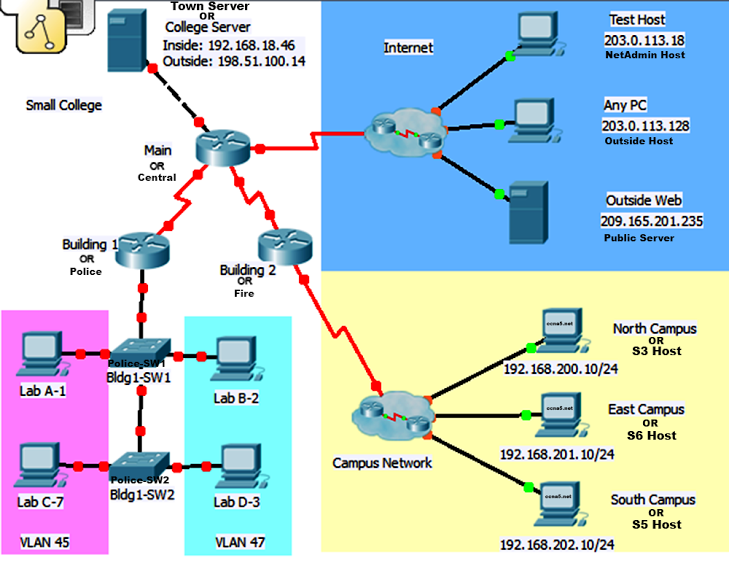 In this practice skills assessment, you will configure the Our Town network with single-area OSPFv2. In addition, you will configure router-on-a-stick routing between VLANs. You will also implement NAT, DHCP and access lists. All IOS device configurations should be completed from a direct terminal connection to the device console. Some values that are required to complete the configurations have not been given to you. In those cases, create the values that you need to complete the requirements. These values may include certain IP addresses, passwords, interface descriptions, banner text, and other values. For the sake of time, many repetitive but important configuration tasks have been omitted from this activity. Many of these tasks, especially those related to device security, are essential elements of a network configuration. The intent of this activity is not to diminish the importance of full device configurations. Note: You are provided with the networks that interfaces should be configured on. Unless you are told to do differently in the detailed instructions below, you are free to choose the host addresses to assign. All configurations must be performed through a direct terminal connection to the device consoles. Assign the first IP addresses in the networks that are provided in the Addressing Table to the LAN interfaces. Assign the first address in the Central subnet to the interface that is connected to the Internet. Assign any valid host address in the networks that are provided in the Addressing Table to the serial interfaces. The host PCs will receive IP addresses over DHCP. Prevent the router from attempting to resolve command line entries to IP addresses. Protect privileged EXEC mode from unauthorized access with the MD5 encrypted password. Prevent device status messages from interrupting command line entries at the device console. Secure the router console and terminal lines. Prevent all passwords from being viewed in clear text in the device configuration file. IP addresses as shown in the addressing table. Describe the operational Police serial interface. The Police Ethernet interfaces will be configured at the end of this assessment. DCE settings where appropriate. Use a rate of 128000. Manually configure default routes to the Internet. Use the exit interface argument. All hosts on the internal LANs and School Network networks should be able to reach the Internet. It has been decided to use static routes to reach the branch networks that are connected to Fire. Use a single summary to represent the branch networks in the most efficient way possible. Configure the summary static route onCentral and Fire using the exit interface argument. Configure single-area OSPFv2 to route between all internal networks. The branch networks are not routed with OSPFv2. Use a process ID of 10.The routers should be configured in area 0. Use the correct inverse masks for all network statements. Do not use quad zero masks (0.0.0.0). a. Set the bandwidth of the serial interfaces to 128 kb/s. c. Configure the OSPF cost of the link between Police and Central to 7500.
d. Prevent routing updates from being sent out of any of the LAN interfaces that are routed with OSPFv2. Do not use the default keyword in the commands you use to do this. Refer to the VLAN table above for the VLAN numbers and names that should be configured on both switches. Configure names for the VLANs. The VLAN names must be configured to match the names in the VLAN Table exactly (case and spelling). Configure the appropriate ports that link the switches and Police with the router as functioning trunk ports. Assign the switch ports shown in the table as access ports in the VLANs as indicated in the VLAN Table. Address VLAN 101 on the network indicated in the VLAN Table. Note that the first address in this network will be assigned to the router in a later step in this assessment. The management interfaces of both switches should configured to be reachable by hosts on other networks. Configure all unused switch ports as access ports, and shutdown the unused ports. Use VLAN45 and VLAN47 as the pool names. Note that the pool names must match the names given here exactly, all capital letters and exact spelling. Addresses .1 to .20 should be reserved for static assignment from each pool. The first address in each network will be assigned to the router interface attached to the networks as shown in the addressing table. Use a DNS server address of 192.168.18.100. This server has not yet been added to the network, but the address must be configured. Ensure that hosts in each LAN are able to communicate with hosts on remote networks. a. Configure static NAT to the Town Server. Translate the internal address of the server to the address 198.51.100.14. Configure the correct interfaces to perform this NAT translation. b.Configure dynamic NAT (not NAT with overload, or PAT). Use the addresses remaining in the public address subnet of 198.51.100.0/28. The first two addresses in the subnet have already been assigned to the Central and ISP serial interfaces. Also, another address has already been used in the static mapping in the step above. Use a pool name of INTERNET. Note that the pool name must match this name exactly, in spelling and capitalization. Hosts on each of the internal LANs shown in the topology and on all of the branch networks should be permitted to use the NAT addresses to access the Internet. Use a source list number of 1. Your source list should consist of three entries, one each for the LANs and one for the branch networks. Create a named standard ACL using the name MANAGE. Be sure that you use this name exactly as it appears in these instructions (case and spelling). Allow only the NetAdmin Host to access the vty lines of Central. No other Internet hosts (including Internet hosts not visible in the topology) should be able to access the vty lines of Central. Your solution should consist of a single ACL statement. Use access list number 101. First, allow NetAdmin Host full access to all network hosts and devices. Then, allow outside hosts to access the Town Server over HTTP only. Allow traffic that is in response to data requests from the internal and School Network hosts to enter the network. Add a statement so that counts of all denied traffic will be shown in the show access-lists command output. Your ACL should have only four statements. Your ACL should be placed in the most efficient location possible to conserve network bandwidth and device processing resources. Step 11: Configure Router-on-a-Stick Inter-VLAN Routing. Use the VLAN numbers for the required interface numbers. Use the first addresses in the VLAN networks for the interfaces. Step 12: Test and Troubleshoot Connectivity. Ensure that the hosts attached to the VLANs can reach hosts on the School Network and the Internet. 1. Before begin please read the whole assesment. 3. And paste them all there without changing. Scored a 94% with these exact commands. Adjust port ranges if you want that 100%!